When looking for a location to host a Hail and Farewell, there are many things to consider. The most important is the notorious Interstate 5 traffic, which can be gridlocked when everyone is trying to get to the event. Also the cost of holding an event at a Joint Base Lewis-McChord (JBLM) venue or in the local community. Here are some suggestions from local military spouses. "Our unit held our most recent Hail & Farewell at the Roy Steakhouse," said Sarah Becking. "Roy is such a friendly little town, happily away from I-5. The steakhouse put on a delicious buffet. We pretty much filled the place up, though there were a few families not connected to our unit who tolerated our noise and socializing with smiles. The steakhouse isn't open all the hours you might expect, so anyone planning an event there should call ahead for arrangements." "We've had good luck at Sam Adams Pub at Eagles Pride Golf Course near DuPont," said Heather Johnston. The Sam Adams Pub is an MWR facility and is open to the public. This is a nice venue if you have people attending who don't have access to the base. Gwyn Nielsen attended 28 Hail and Farewells when her husband was in command. "We never went to the same place twice. It was never prepay but select off the menu so you choose how much you wanted to spend. We always went to a different restaurant in the community every single month. It was a great way to give back to the community and all the restaurants were happy to have our business," she said. 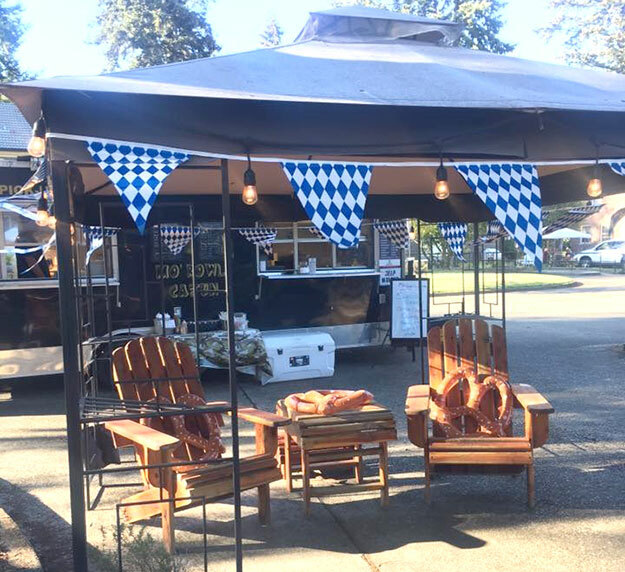 Another popular option is to bring in a food truck and host the party at your home. Many of the food trucks on base with contracts are more than happy to help with events. It is so convenient to have a truck pull up to your house and set up shop. Everyone orders and pays for their own food, which makes it very convenient for the hostess. When planning an event, make sure to convey to a restaurant how many guests are expected. Once you get past 15, many restaurants will require that you order off a banquet menu and prepay. Others are more accommodating and will have a shortened menu guests can order from. Keep the restaurant apprised of your numbers and update frequently if there are any changes. If you are planning an event off base, you may want to start later so traffic won't be as heavy allowing your guests more time to reach the venue. Local travel websites are a great way to research restaurants and venues. Two to check out: traveltacoma.com and experienceolympia.com. Also, visit military spouse Facebook pages which often have the pros and cons of different locations.